The amount of personalized Christmas cards being sent over the holidays has definitely surpassed the store-bought, 24-pack assortments you used to send featuring the same message in every card. Now mantels and refrigerators are filling up with so many personalized Christmas cards from friends and family, it’s difficult to find room for them all! Shop our collection and find a one-of-a-kind design that suits you and your family perfectly. 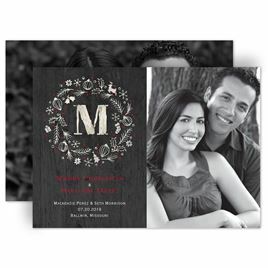 We promise the look and quality of our personalized Christmas cards will stand out from the rest. Looking for photo cards specifically? Shop photo Christmas cards.